Successfully Added Car Charger Hub (Dual USB, Dual Cigarette) to your Shopping Cart. Meet the cheapest and most convenient way to power more than one piece of electrical equipment in your car. As well as converting your vehicle's regular cigarette lighter socket into two car lighter sockets, this Car Charger Hub also includes two USB charging sockets, allowing up to four electronic devices to be charged at once! Do you ever find your iPhone, MP3 player, cell phone, GPS navigator, or any other USB powered device running out of power more often than you would like? If you are the type of person who spends more than 15 minutes a day in your car, put that time to good use and re-charge your personal electronic devices with this Car Charger Hub! This simple but effective Car Charger Hub allows you to add two USB charging ports to your car as well as providing an additional car cigarette lighter slot, letting you instantly have a charging ports for up to four devices at once! Simply plug it into your car's cigarette lighter and you'll have the easiest way to keep your cell phone, MP3 player, digital camcorder, and other USB powered devices powered-up. Giving your car the power to recharge multiple electronic devices on the go makes this Car Charger Hub an essential car accessory. Available in our warehouse now, order today and we'll express ship it out tomorrow! Brought to you by the leader in wholesale Chinese electronics and car accessories, Chinavasion. Charges cell phones, GPS devices, MP3 players, etc. 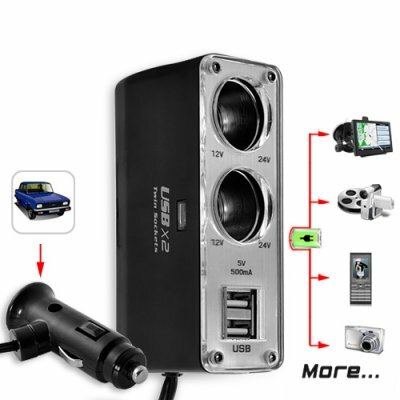 How is this USB Car Charger so cheap? I see others online for over 10 times the price! We bring you this USB Car Charger at an amazing factory-direct price, which means no middle man, no markup! What kind of devices can I charge? MP3 players, phones, camcorders, digital cameras, MP4 players, and much more!